Last month, I met a friend in Boston and we spent a few hours wandering around. We were in Chinatown, and on a mission to find an Asian market called Super 88, but we had no luck. We saw the parking area, and a sign with an arrow that said “Welcome” but we could not, for the life of us, find the door. Anyway, we set off to find an Asian bakery instead, and stumbled upon a place called Great Taste Bakery (63 Beach St). We found lots of the expected, and a bit of the unexpected. There were tons of yummy-looking pastries screaming our names, but the thing that jumped out at me the most were the Portuguese pastries (!!!!). 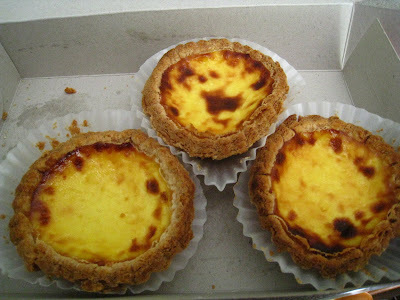 They looked exactly like the Pastéis de Nata or Pastéis de Belém that we ate on our weekend trip the Portugal last year. They’re made of delicious custard, surrounded by flaky pastry, and bruléed on the top. Of course, we grabbed a few for the road, and they the taste was quite authentic. What a find! Hey, why not? Everyone could use some Portuguese pastries!